There is absolutely no scientific evidence that any breed of dog is hypoallergenic. The allergenic proteins found in dogs that cause problems for allergy sufferers are called Can f 1 and Can f 2, short for Canis familiaris allergen 1 & 2. All dogs make these proteins, which are found in saliva and are secreted by sebaceous glands in the skin. The sebum deposits these proteins onto the hair and shedding skin cells (dander) of the dog. The dander is the primary contributor to allergy symptoms, not the hair. Dogs that shed less hair or have shorter hair don’t produce less dander. All dogs produce dander containing Can f 1 & Can f 2, and all dogs can contribute to allergy symptoms. In the scientific and medical community, the idea of hypoallergenic dogs is considered a myth. This is one of the most widely perpetuated allergy myths and is not only misunderstood by most patients, but is considered fact by many misinformed doctors. Contrast dye is a substance injected or taken orally that enhances certain medical imaging studies. These contrast agents often contain iodine, but the iodine has nothing to do with the allergenicity of these materials. Iodine also has nothing to do with the allergenicity of shrimp. These allergies are completely unrelated. An allergy to shrimp has no predictive value as to whether someone will have an allergy to contrast dye. The allergens in shrimp are proteins. There are no true allergens in contrast dye. Rather, these agents cause allergic-like reactivity by causing sudden fluid shifts between the bloodstream and the surrounding tissues. It is the osmolality of the contrast dye that causes the reaction. Newer low osmolality agents cause significantly fewer reactions but are not universally used as they are more expensive than older high osmolality agents. Both of these myths are false for the same reason. It has to do with the size of the pollen in different plants. Pollen is part of the male reproductive organ of plants and produces the sperm that allows for sexual reproduction. Different plants use different strategies of pollination. Some plants form tiny pollens that aerosolize and float through the air in the hopes of randomly finding their female counterparts. In order for this strategy to work, the plant has to release massive quantities of this tiny pollen. These high quantity, small-sized pollens are inhaled by any man or beast that happens to be outdoors during pollen season, and they are the ones that cause allergies. Other plants produce large pollens designed to adhere to the legs of insects. These plants produce flowers that attract insects, which unknowingly carry the pollen from one flower to another. These pollens do not become aerosolized to any significant degree and do not generally cause allergies. For this reason, we do not become allergic to plants with pretty flowers. Goldenrod, for example, does not cause allergies. It just happens to flower at the same time that ragweed pollen is being released. The idea of eating local honey is interesting because, in theory, we could become desensitized to pollen if we eat it. There are several reasons why eating honey does not alleviate allergies, but the most obvious reason is that honey is produced from flowering plants which contain the wrong pollens. Wrong! The large majority of seasonal allergy sufferers are not allergic to pine pollen. Pine pollen is large and is released in clumps. It generally falls to the ground quickly and does not aerosolize like smaller pollens. The myth stems from the fact that pine pollen is released at the same time that many other trees are releasing their pollen, most importantly oak trees. Oak pollen is much smaller and is significantly aerosolized. It is the cause of most springtime allergy symptoms in this area. This myth has some truth, but is not true for all nasal allergy sprays. In fact, there is a big difference between most sprays that are available over the counter and those that are available by prescription. Most over-the-counter nasal sprays fall into the category of decongestants. Congestion occurs in the nose when there is excess blood flow to the nasal tissue. This is common when there is inflammation, as part of the inflammatory response is increased flow of blood to the inflamed tissue. Decongestants constrict blood vessels and reduce the size of nasal tissue by reducing blood flow. The effect of these topical decongestants can be felt almost immediately and the relief they provide can be dramatic. However, several hours later they often contribute to a significant increase in congestion as the body’s counter-regulatory mechanisms attempt to restore blood flow to the nose. This rebound congestion often leads to repetitive use of these products. Don’t get stuck in this trap! One of the most problematic nasal conditions, called rhinitis medicamentosa, occurs in patients who become “addicted” to these over-the-counter topical decongestants. Most prescription nasal sprays are not decongestants and do not cause rebound congestion. The most popular prescription sprays are topical nasal steroid sprays, and they are the most effective medications for nasal allergy symptoms. Their effects are not immediate, as they do not constrict blood vessels. Rather, they have potent anti-inflammatory effects that occur as a result of disrupting inflammatory signals in the nose that result from exposure to allergens. Nasal steroid sprays can be used regularly and are not addictive. To find relief from our allergies, it helps to understand them. 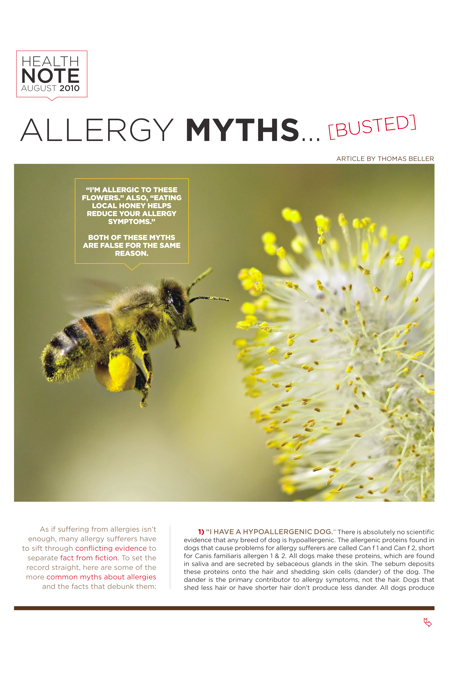 Spread the word so these allergy myths can be forgotten. Sister Act: It’s Rainin’ Nuns, Hallelujah!